FBI director James B. Comey watches his wife, Patrice, testify in Hartford. The FBI director, James B. Comey, did his best Friday to disappear into a crowded hearing room at the Legislative Office Building, not an easy task for a man who stands six-feet, eight inches tall and travels with a pack of bodyguards. 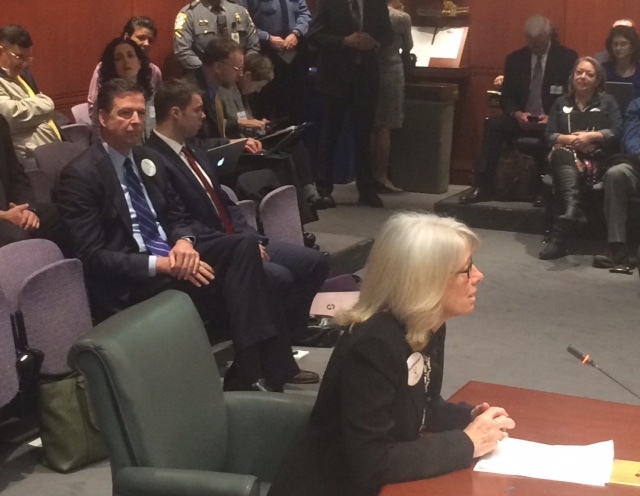 Comey is a veteran of congressional hearings, but his role in Hartford was as a supportive spouse, using a smart phone to photograph Patrice Comey as she testified about the couple’s experience as foster parents and the need for greater support of neglected children. The Judiciary Committee is considering a bill that would expand the court system’s use of court-appointed special advocates, trained volunteers who make sure that children in foster care do not disappear into the bureaucracy. The Comeys met privately before the hearing with Sen. Eric Coleman, D-Bloomfield, the co-chair of Judiciary who shares more in common with the FBI director than a career as a lawyer: Coleman and his wife also are foster parents. At the outset of the hearing, Coleman acknowledged the presence of the FBI director, the retinue of agents in his security detail and the resulting buzz in the Legislative Office Building about the heavy, unannounced arrival of the FBI. “We’re not being investigated,” Coleman deadpanned. It wasn’t entirely funny. FBI agents have come to the Legislative Office Building at least twice in recent years to investigate legislators, but Comey only smiled and did not contradict Coleman. The Comeys have homes in Virginia and in Fairfield County, but they are making the transition to being full-time residents of the Washington, D.C., metro area as the last of their five children leaves for college, Patrice Comey said. James and Patrice Comey, at right, with Stacey G. Sobel and another supporter before the hearing. President Obama appointed James Comey, a Republican former U.S. deputy attorney general who became counsel to the Westport-based Bridgewater Associates, the world’s largest hedge fund, as FBI director in May 2013. After her husband joined Bridgewater in 2010, Patrice Comey enrolled as a graduate student in a counseling program at Fairfield University, completing a master’s degree in 2015. She volunteered as a “CASA,” as court-appointed special advocates are known, in juvenile court in Bridgeport. The Comeys acted as foster parents in Connecticut, mainly for babies and toddlers who had been removed from their homes by the Department of Children and Families. They had been foster parents in Virginia when Jim Comey was a top Justice Department official during the administration of George W. Bush. The volunteer work sparked the return to graduate school. The CASA program was billed as a low-cost expansion of services, an idea that Sen. John A. Kissel, R-Enfield, told Comey was attractive as the state struggles with a fiscal crisis. “We’re going to have to be creative and do far more with less,” Kissel said. But the Judicial Department warned in testimony submitted to the committee that there would be some unspecified cost to oversee the volunteers and administer the program. Given the budget, the department said it could not recommend passage. But the Department of Children and Families supports the legislation, which would expand the role of the volunteers beyond small pilot programs. It also has the backing of Senate Majority Leader Bob Duff, D-Norwalk. Coleman and his co-chair, Rep. William Tong, D-Stamford, left no doubt that their committee would report the bill to the Senate floor. Comey told them the expanded services essentially would be free. Comey said the volunteers can provide a level of attention not possible from judges, court-appointed lawyers or even social workers, who have heavy caseloads. A lawyer serving as a guardian might have as many as 100 children as clients, she said. The CASA concept has taken root nationally and is supported by a wide range of child experts, including Marian Wright Edelman, the founder of the Children’s Defense Fund. Comey said research shows children with CASA volunteers are less likely to re-enter the foster system and more likely to succeed in school. Comey said her husband was supportive in opening their house to foster children, but made clear that five children were enough and adoption was not an option. The legislators and audience laughed. 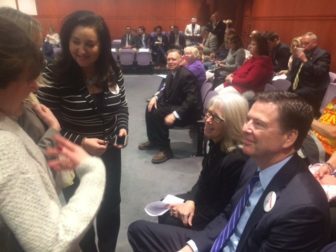 Stacey G. Sobel, the executive director of Child Advocates of SW Connecticut, which trains the volunteers, said a chance meeting with Comey led her to volunteer and, now, take a leading role in pushing for the legislation. “When you meet a person like Patrice Comey, you cultivate the relationship,” she said. After leaving the hearing, James Comey deferred all inquiries from a reporter to his wife. He patiently posed for photos with a steady stream of people while Patrice Comey was interviewed.